Marcus came straight back into the starting line up as he returned to league action after his knee injury. He played 63 minutes as Oxford beat Plymouth to move off the bottom of league 1. 24' Browne's shot hits the wall. He gets the rebound into the mix and when the ball comes back to him his venomous shot goes just wide. 26' YELLOW to Yann Songo'o for a foul on Browne as they competed for a header. United claiming he led with his elbow. 37' Browne breaks and carries the ball to the edge of the Plymouth area. His back-post cross is met acrobatically by Holmes but he can't keep his shot on target. 41' Browne races forward out of defence, outpacing the Argyle back line, He passes to Henry and his deep cross is kept alive by Holmes but eventually the move breaks down. 45+2' Browne slips the ball wide to Henry. His shot from the edge of the area is inches over. 48' A neat back-heel by Browne finds Henry on the overlap but Moore does well to intercept. Henry's cross is then almost turned goalwards at the back post. 58' Browne is on to Dickie's long ball forward and outpaces Moore, who recovers well to make the tackle and concede a corner. 62' Browne finds Brannagan who drives forward and shoots . It goes across the goal and just wide. It must have taken a touch as the ref awards a corner. 63' SUB for United: Marcus Browne is replaced by Shandon Baptiste. Marcus played 78 minutes as Oxford drew 0-0 at Bristol Rovers. He was cautioned in the first half for a late aerial challenge. 3' United looking dangerous going forward with Browne involved. 10' Browne does well to ride three tackles going forward. The attack continues and McMahon's cross is deflected out for a corner. 18' Baptiste works the ball wide for Browne who escapes his marker and gets deep into the Rovers area before his shot is blocked. 26' YELLOW to Browne for clattering into Tom Lockyer as they go for a header together. 46' We're underway in the second half. Still goalless as Henry attempts to get onto Browne's through ball. 57' Eastwood's long kick is knocked out by Partington, under pressure from Browne, for a United corner. 63' United go up the other end an Browne pulls the ball back for Mackie whose shot from 12 yards is blocked. 70' Browne opens his legs to break into the Rovers half. He gets the ball wide to Henry and it eventually falls for Whyte whose shot is dived on by Bonham. 72' Mousinho in with a couple of ferocious challenges. Browne goes down for treatment and the players take advantage to have a quick drink. 77' Sub for United: Marcus Browne is replaced by Jamie Hanson. Jordan played the final 11 minutes as Middlesbrough won 2-1 at Sheffield Wednesday to return to the top of the Championship. Toni played 72 minutes as Rayo were eliminated from the Copa del Rey at the third round stage, losing on penalties to Gijon after a 1-1 draw. 9' Toni Martínez wins a free kick in the defensive half. 27' Foul by Toni Martínez. 59' Hand ball by Toni Martínez. 62' Toni Martínez wins a free kick in the defensive half. 72' Substitution, Rayo Majadahonda. Nicolás Schiappacase replaces Toni Martínez. Josh played as Charlton beat Barnsley 2-0. 14' Cullen's corner causes havoc in the box, but Barnsley eventually hack it clear. 87' Unbelievable work from Cullen to cut out a Barnsley cross in mid-air. so only Cullen doing well on loan but he is not good enough for us. hammerman11 wrote: so only Cullen doing well on loan but he is not good enough for us. They love Browne at Oxford, far too good for that league apparently. Lee Bowyer said Cullen is better than he was at that age, he’s got time. Martin came on as an injury-time substitute as Venlo won 2-0 against Den Haag. Toni played 26 minutes as Rayo sought a winning goal at Reus, only to end up losing 2-1 to the Segunda Division strugglers. Edi was one of Fiorentina's better players as they drew 1-1 with Cagliari to lose their 100% home record. He completed 42/45 passes (93%) including 2 key passes. He was successful with all three attempted tackles, and earned a final match rating of 6.79. Marcus played 66 minutes as Oxford went 4 unbeaten with a 1-1 draw with Charlton. 19' Browne gets on the end of a rebound and tries a 25-yard shot but he scuffs it and the ball goes harmlessly wide. 49' Browne on the right drives into the Charlton area and wins a corner. 50' The corner is cleared but United work it to Browne who shoots from 20 yards but Steer gets down to it. 64' Browne cuts in from the right and finds Ruffels on the opposite flank. He shoots from outside the area but the ball goes over. 66' SUB for Oxford: Marcus Browne goes off to be replaced by Gavin Whyte. Marcus then played 17 minutes as Oxford secured their biggest win of the season with a 3-0 triumph over struggling Shrewsbury. He scored the third goal shortly after coming on, his third of the season. 73' SUB for Oxford: James Henry is replaced by Marcus Browne. 86' A Shrewsbury clearance hits ref Martin Coy and Jamie Mackie slips the ball through to Browne, who finishes neatly past Coleman. Jordan played the final 7 minutes as Middlesbrough drew 0-0 with Rotherham in midweek. He was then an unused sub at the weekend as Middlesbrough drew 1-1 with Derby. Edi played the first half as Fiorentina drew 1-1 at Torino. He completed 10 of 14 passes (71%) and was awarded a final match rating of 5.89. Josh played as Charlton drew 1-1 with Oxford in midweek. 45+1' Oxford's Josh Ruffels is booked for a late tackle on Cullen. 71' Cullen and Holmes clatter into each other on the half-way line, Oxford keep playing and Whyte hammers the ball into the top corner from 18 yards. 82' Pratley glances on a Cullen free-kick but his header goes over the top. He then played the full match as Charlton lost 1-0 at Rochdale. He was cautioned for a second half foul. "In the second half, Josh Cullen's 25-yard drive looked destined for the roof of the net until Moore pushed his shot against the post. And Cullen was frustrated again when his direct free-kick beat Moore and found the back of the net - only to be ruled out for an infringement by Taylor." 65' POST! Great save from Moore to push Cullen's goal-bound effort on to the left upright. 66' It looked like we were level as Cullen's 20 yard free-kick deflects into the net, but the celebrations are cut short by the linesman. It can only have deflected off a red shirt in an offside position, but difficult to see from here. 82' Cullen booked for a foul on Dooley. The Addicks midfielder looked to have got to the ball first. Martin played the full match as Venlo lost 2-0 at AZ to go out of the KNVB Cup. Jordan played 55 minutes as Middlesbrough progressed to the EFL Cup Qtr Finals with a 1-0 win over Crystal Palace. 37: WHAT A CHANCE! George Friend swings the ball into the box and Jordan Hugill's side-footed effort just clears the crossbar! Unlucky! 55: Boro making another change. Jordan Hugill is replaced by Rudy Gestede. Marcus played 19 minutes as Oxford lost a 3-0 lead to draw 3-3 at Scunthorpe. He was introduced shortly after the equaliser. Martin played the full match as VVV lost 2-0 at AZ. not in squad - he might have a chance of making the squad for Malaga's next fixture. They picked up an injury and 2 red cards yesterday! Jordan played the full match as Middlesbrough drew 0-0 at Stoke. "Home goalkeeper Jack Butland made excellent saves to deny Jordan Hugill and Jonny Howson as the visitors pushed for a late winner." "Hugill should have put Tony Pulis' men ahead when he was played in on goal but England goalkeeper Butland did well to get out and divert his effort around the post." 65: BIG CHANCE! Jordan Hugill fights his way through for a one-on-one opportunity but Butland does well to deny him! 71: Mo Besic whips the ball across goal, just out of Jordan Hugill's reach. Toni played the second half as Rayo lost 2-0 at Alcorcon. Edi played 37 minutes as Fiorentina drew 1-1 with Roma. He completed 6 of 9 passes (67%), had one off-target shot, won 2/2 tackles and was awarded a final match rating of 6.38. Josh made his 10th start of the season as Charlton comfortably beat Doncaster 2-0. His corner set up the opening goal. "A whipped inswinging corner from Josh Cullen hit a Doncaster head and came crashing back off the crossbar, Aribo reacted quickest and did well to poke home from inside the six-yard box." Last edited by LeonRivers on Fri Nov 09, 2018 3:45 pm, edited 2 times in total. Marcus Browne been dropped to the subs? THought he was Oxford's star man. steveyrockstar wrote: Marcus Browne been dropped to the subs? THought he was Oxford's star man. He's not quite made it back as a regular starter since returning from injury recently. Marcus played 75 minutes, scoring the second goal, as Oxford won 3-0 at Wycombe in the Checkatrade Trophy. 16' Foul by Marcus Browne. 17' Attempt missed. Marcus Browne right footed shot from the right side of the box is close, but misses to the right. 19' Foul by Marcus Browne. 31' Goal! Wycombe Wanderers 0, Oxford United 2. Marcus Browne right footed shot from the right side of the box to the high centre of the goal. 38' Foul by Marcus Browne. 48' Attempt saved. Marcus Browne right footed shot from outside the box is saved in the centre of the goal. 66' Attempt saved. Marcus Browne left footed shot from the left side of the box is saved in the centre of the goal. 72' Marcus Browne wins a free kick on the right wing. 75' Substitution, Oxford United. Sam Long replaces Marcus Browne. Josh played 80 minutes as Charlton won 2-0 at Walsall, picking up a caution and assisting the second goal with a corner. Cullen is out for 4 months after surgery on his shoulder. He dislocated it in his previous game sadly. Charlton fans have been raving about him. maybe time to bring Fernandez back and give him some time under pelle. seems to have done ok in Italy. 22 years fit strong good passer energetic. just what we need in the midfield area. prefer this to bringing nasri in . The Green Man wrote: Cullen is out for 4 months after surgery on his shoulder. He dislocated it in his previous game sadly. On-loan Charlton Athletic midfielder Josh Cullen needs shoulder surgery and could be missing for up to four months. The West Ham youngster dislocated his shoulder in Tuesday night’s 2-0 win over Walsall. And Igor Vetokele suffered the same issue and also had to be replaced at Banks’s Stadium. And the initial prognosis looks as if their pair will both be sidelined for a significant period. “Josh needs an operation, so he’s going to be maybe three or four months from what I hear,” said Bowyer. “Igor we won’t know much until Friday because he hasn’t had his MRI scan yet. I’m guessing he is going to be similar because he had to go to hospital [after his dislocation]. “Josh has done something to his bicep as well, The physio went a bit technical with me. He will be seeing a specialist in the next couple of days to go through stuff. Marcus played as Oxford drew 0-0 with Forest Green in the first round of the FA Cup. Jordan played 69 minutes and scored both goals as Middlesbrough beat Wigan 2-0. "A first-half double from Jordan Hugill sent Middlesbrough back up to second in the Championship with a routine win over Wigan. Hugill opened the scoring from the penalty spot after Cedric Kipre had brought down George Friend in the penalty area before making it 2-0 with a header from Martin Braithwaite's cross." "Hugill's goals were his first in the league since scoring for Preston against Boro on 1 January and he could have scored more but for Wigan keeper Christian Walton's excellent save to deny him an early opener." I was really pleased that Jordan got the two goals. What people have missed, and I've said it before, is that the lad went from Preston to West Ham and was never involved in any football at all in the Premier League. Then in pre-season he got an injury, so he hasn't really done anything for six months. He came here really cold, his fitness levels were nowhere near those of the rest of the group, but he's worked really hard and, in the last few games, we've seen some good signs. The great thing about him is that he's got that little bit of steel about him. He's a local lad and he's desperate to do well for this football club."" 10' Jordan Hugill in the thick of things early on, winning headers and bringing others into play. 38' GOAL! Penalty to Boro. Straight down the middle from Jordan Hugill. The keeper is fooled and it's his first league goal for Boro! 44: GOAL! Martin Braithwaite's cross proves too hot to handle, and Jordan Hugill has time to chest down and lash in his second! Edi played 24 minutes as Fiorentina drew 1-1 at Frosinone. He completed 16 of 18 passes (89%) and was awarded a final match rating of 5.9. Last edited by LeonRivers on Thu Nov 22, 2018 8:38 am, edited 1 time in total. 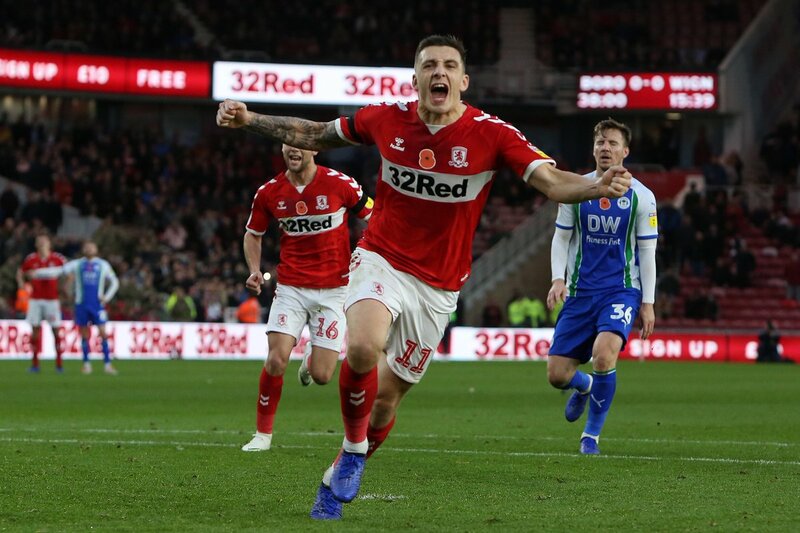 Middlesbrough boss Tony Pulis hailed the hard work of two-goal hero Jordan Hugill. The striker tucked away a 38th-minute penalty and added a second before the break to grab his first two league goals for his hometown club on a season-long loan from West Ham. That meant Boro stretched their unbeaten run in all competitions to six matches. Wigan’s goal led a charmed life until Cedric Kipre made it easy for George Friend to win the penalty and Hugill sent keeper Christian Walton the wrong way. It was the first spot-kick Boro had scored at home for two seasons. Hugill doubled his tally when Martin Braithwaite swept the ball in from the left and, though Walton got a hand to it, the man of the moment chested down and hammered home a half-volley. Manager Tony Pulis was delighted with Middlesbrough-born Hugill, saying: “I was really pleased Jordan got the two goals. The lad went to West Ham, was never involved in any Premier League football, then got an injury and came here cold. He didn’t want anyone else to take that penalty, that’s for sure. Jordan keeps getting in there. He’s a local lad who’s desperate to do well for this club. Middlesbrough’s victory ended a run of four home league games without a win, and featured a remarkable 11th clean sheet from their 17 Championship matches this term. Hugill went into the game still searching for his first league goal in a Middlesbrough shirt. It had initially looked as though it might be a frustrating afternoon for the West Ham United loanee, with three early half-chances going begging. Hugill failed to find the target with headers from crosses from Dael Fry and Stewart Downing, and when he did get an effort on target, Wigan goalkeeper Christian Walton was able to claw the ball around the post. But like London buses, two arrived within the space of five minutes at the end of the first half. Even before the goals the Hemlington Hitman had been catching the eye with a powerful and physical performance. He showed strength with his back to goal to out-muscle defenders and following his chat with Tony Pulis he stayed upright.A string of darting runs took him into dangerous positions and three times before he netted he put good headers just over. After he scored he looked faster, fitter and had a real spring in his step. Hopefully that brace will add a mill or two onto his current value. Marcus played as Oxford made it eight games unbeaten with a 1-0 win over Gillingham to climb out of the relegation zone. He won the penalty that was successfully converted for the games only goal when he was brought down by the Gills Goalkeeper. He was also cautioned for a foul, his fourth yellow of the season. "Brown’s pace is frightening and when he touched it past the onrushing keeper he was caught and brought down, with ref Neil hair pointing straight to the spot." "United were rampant with Browne running riot, Brannagan bossing the centre of the park and Bradbury leading the line well." 58' PENALTY to Oxford as Marcus Browne is upended. Henry to take. 72' YELLOW to Gills skipper Gabriel Zakuani after he tangled with Browne. 83' YELLOW to Browne for jumping in to Barry Fuller. Sead made his Malaga debut, coming on as a half-time substitute in a 2-0 home win over Gimnastic.